Here’s another splendid prefecture in the Peloponnese that represents a pleasurable handful for the alternative traveller and eco-tourist, combining city, nature and beach in a marvelous way. Take Akrata on the northwest coast overlooking the Korinthian Gulf, where there are pristine beaches, wonderful villages and lots of culture to boot. Vineyards, archaeological remains (Grasidopia) and delicious raisins and good wine await visitors. In the same municipality hides the village of Zarouchla, hovering between 1000 and 1200 meters above the sea, on the slopes of mount Helmos, with stunning greenery, fauna and flora. Cold water springs, as well as trees full of cherries, apples and nuts will whisk you to a dreamier state. Here, the towers of Haralambi and Fotila add to the mystique, while the churches of Panagia, Agia Triada and Taxiarhes throw in some Orthodox spirit for good measure. Exploration of nearby village and Lake Tsivlou is recommended. Moving on, the preserved character of Diakofto and its environs will leave you gaping in delight as well. 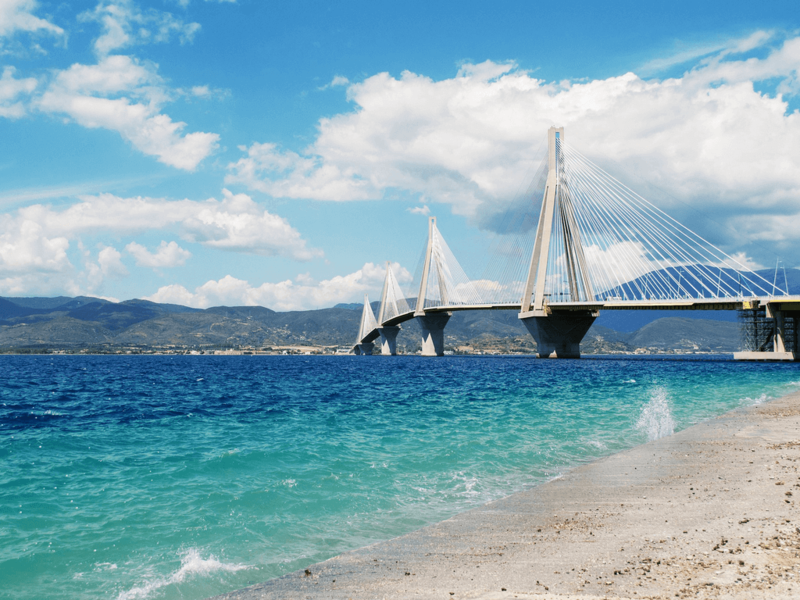 Visit the old train station and the railway museum, then hop on the train to the Vouraikos gorge, through the forest of Zarochlou up to the delightful traditional ski-town of Kalavrita – worth visiting any time of the year. Note how the village of Zachlorou lies serenely on the slopes of Marathia. This too is an excellent all-year-round destination, with monasteries, caves and the Vouraikos gorge all nearby. In winter, skiers will always want to make the quick jump to Kalavrita. Worth mentioning too is that Diakofto is well known as a hotbed of arts and culture, a comfortable locale of choice for many a painter and actor. In the mountain village of Upper or Ano Diakofto, traditional dwellings, tavernas and the source of the river Psamiakos will undoubtedly titillate you. Similarly, the many villages of Aegio on its hills are surrounded in greenery and the lower villages by olive groves and vineyards, while further down, the beach of Punta beckons in the distance. One of Aegio’s municipalities is Fteri, built on 1,100 meters of altitude, and proud of its mineral waters, natural springs, mountains and forest which takes you to the village of Pyrgaki. Villages tucked around Fteri and worthy of a visit are lush Plataniotissa, quite Petsaki with its 10 small churches, hidden Lapanagi and the historic Ano Mavriki. Each has attractions, traditions and feasts that seduce the newcomer. On another front, some 49 kilometres from Patra lies Kalentzi, full of guest houses, flowers, trees and the small gorge of Poros. While its inhabitants initially settled at a high 1,300 metres above sea level to escape the Ottomans, they eventually descended to 900 meters to avoid the cold mountain winters. Now the old village stands hauntingly empty, awaiting the daring summer explorer. The inhabitants of the area, incidentally, are known to live a long, healthy life. On an eco front the village of Klitoria, surrounded by rolling water and water mills boasts an environmental training centre complete with hostels and guest houses, as well as a school that undertakes environment-related seminars. Here’s a sandy beach that’s 80 kilometres long, located near a protected site under the Ramsar convention, not far from the Prokopos Lagoon and Strofilia forest. Sporting activities including windsurfing are available at this beach. If you rent a bike you can discover the natural area around. You'll love the Kotychi lagoon if you're a birdwatcher. Brackish in nature with many sea dunes and marshy patches of saltwater, the lagoon is part of the International Bird Areas (IBA) included in the Ramsar convention. This is a vacationland for birds, who stop by to breed and en route to other countries. Breeders such as the Fudge Duck and Lesser Kestrel compete with passers-by such as Little Egret, Great Egret, Glossy Ibis and others. Hunting is a serious problem, and any birdwatcher would be wise to report infractions to authorities. You must also be careful with the dunes and topography of the place as tourism hasn't always been kind to it. In the nearby Strofylia wetlands, you are sure to spot the Collared Pratincole and Little Tern, considered rare bird species in the area. Your trip to Kotychi and Strofylia wetlands can begin at the village of Lappa, where there is a Visitor Centre that provides information. In Achaia, the rivers Ladonas and Erimanthos are ideal for kayaking and rafting. In this uniquely beautiful area, one can combine physical exercise with the beauty of nature. The Helmos TopoGuide, a fantastic new hiking app, has just been released for Helmos, Peloponnese. Great images, 31 wondrus hiking routes, geological curiosities and even roadmaps will guide users on amazing journeys. www.ecotourism-greece.com is proud to have contributed its insights to this app! You can download this app from Google Store here! Ski center – Alpine refuge – Neraidorachi – Psili Korifi – Mavrolimni – Styga Waterfalls. Elevation: Alpine refuge 2100 meters – Neraidorachi 2340 meters. As with hiking, the Vouraikos Canyon is a superb starting point for mountaineering. 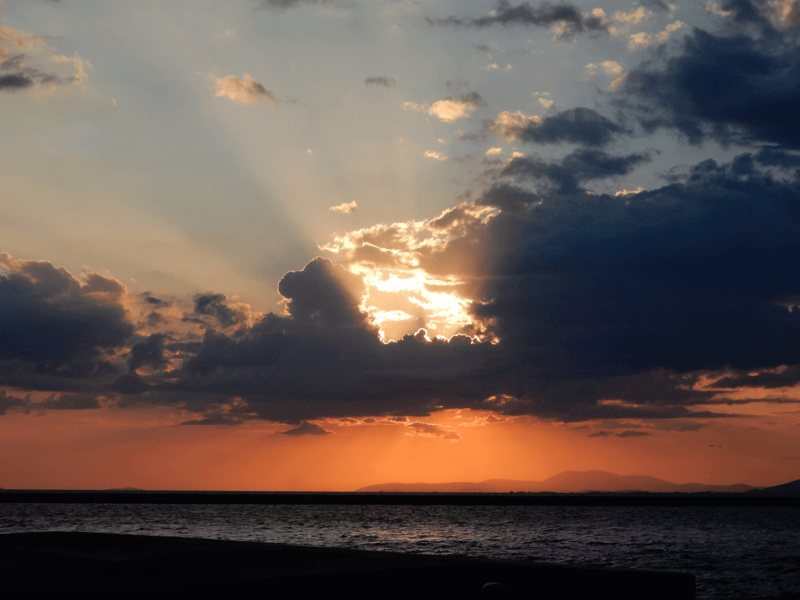 Over half of Achaia is chock full of mountains and valleys, such as the Erymanthos mountain at 2,220 meters, the Chelmos mountain at 2,138 meters, and the Panachaikos mountain at 1,924 meters. Begin from Miha village and head for Muggila peak up to the summit, at the top of Olenos mountain (2,224 meters). Climb from the historic village Kalentzi up to Profitis Ilias (2,214 meters), continuing to Mount Erymanthos. Somewhat easier, begin from the village of Alepochori and follow the path parallel to Katarraktis until you reach the Monastery of Taxiarches at 1,000 meters of altitude. Head from Metochi Vlassias to Kallifoni peak at 1,996 meters. 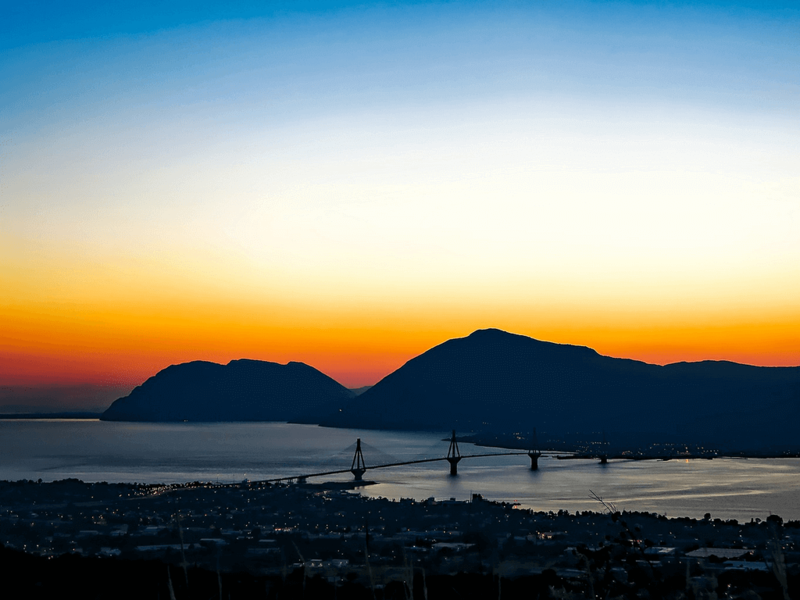 Mount Panachaikos, closer to Patras, features three ascents to the top, considered mostly of medium difficulty level: Head up from the village of Pournarokastro to the mountain shelter of Psarthi which falls under the responsibility of the Greek Mountain Club. Continue climbing to Ai-Giorgis mountain at 1,806 meters, then return through the village of Ano Kastritsi or continue climbing from Pournarokastro up to Vodia and the Prassoudi mountain shelters. You will end up in Palavou Pyrgou at 1,926 meters above sea level. Alternatively, from Ano Kastritsi you can climb up to Pigi Paschalianon, which ends at Dritselo and the Prassoudi shelter, at an elevation of 1,594 meters. Mount Chelmos is ideal for climbers with limited experience, with four main ascents taking you to the top, categorized from medium to high difficulty. Take the E4 trail from Diakopto near Kalavrita and head to Lykouria, passing through Zachlorou, Kalavrita, Kato Loussoi, Planitero, Arvouna, Agios Nikolaos, Tourlada and Krinofyta. Begin the Ladonas river springs and head through the village of Pagrati to reach Klima Pafsania or Pausanias Vineyard at 860 meters of elevation. Begin from Skepasto at 700 meters and cross Panagia Plataniotissa, heading on the path up towards the Monastery of Makellaria. Alternatively take the easy path from Nassia at 700 meters and follow the trail to the end of lake Ladonas, passing by the Barbo forest, Kokkinovryssi and Ksirokritena. Chatzouri: Also known as "the temple"
The area around Patras is nature's treasure of limestone crags, ranging from 20 meters to 700 meters. The latter refers to Mount Varasova, which is one of the most exciting rock-climbing destinations in the country. The crags are located in the countryside or by the seaside, with some perched on mountains such as Helmos. There's a lot of diversity in colour, texture and angle, making it ideal for both beginners and highly skilled rock climbers. The prefecture also offers 7th grade and 8th grade climbing (French scale) making it popular with die-hard climbers and extreme sports enthusiasts. 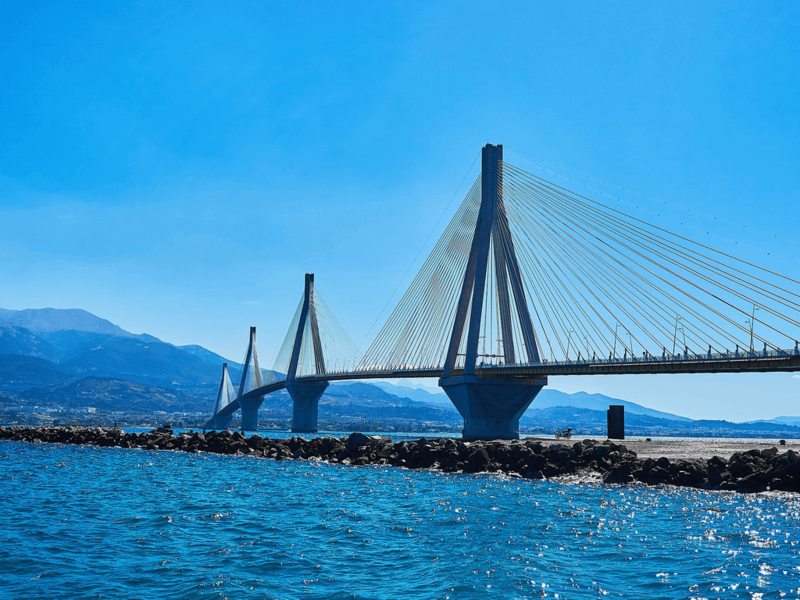 The Gulf of Patras or Patraikos is an amazing place to sail thanks to its northerly winds (plus north-easterly and north-westerly), surrounded by natural beauty and coastline all over. 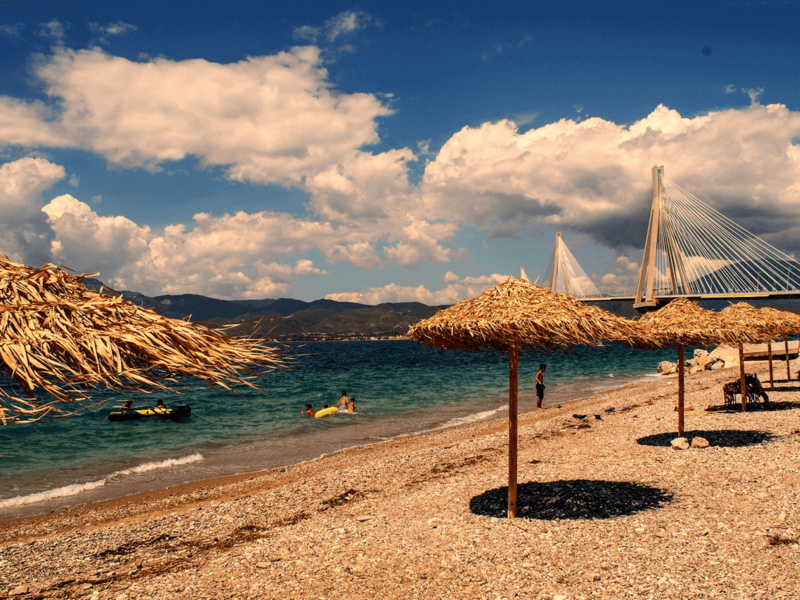 Lying between Araxos and Kato Achaia here’s a 500-meter beach with mixed sand and pebbles. To the north lies the popular beach of Mavri Miti or ‘Black Nose’ which has amazing find sand and great views of Mesolongi. Pounta beach is a clean, attractive beach with pebbles in the Municipality of Diakopto. It is 800 meters long and a full 30 meters wide. Eucalyptus, heather and pine trees dot the beach, which also offers a couple of cafes and restaurants. Not far from this village which is being excavated to find remains of an ancient city, there is a clean beach that is popular with local tourists. There are four AOC wines produced in this region. These are the dry white wine called Patra and made with the Roditis grape, two sublime white dessert wines known as Moschato Rio and Moschato Patron, and last but not least the well-known Mavrodaphne, a strong and sweet red wine made from Mavrodaphne and Corinthian grapes. Also worth mentioning is areas of Mintilogli and Roitika in the municipality of Paralia not far from the Gulf of Patras are also known for their vineyards and quality wines.